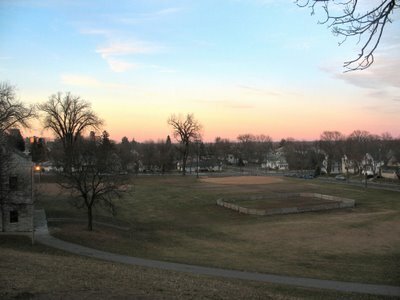 I've always liked it here on this hill that over looks Baker Playground on the West Side. I have many memories from here sliding in the winter, playing football on the field below, skating on the ice rink when there is ice, shooting baskets into the hoop just out of frame to the right, baseball at times, flying a kite in the spring, once got a boomerang caught in the largest tree on the far side of the field. But the view, oh the view can be wonderful at times. There is an indoor rec center behind be where I am standing. You can see just above the treeline and into and beyond the East St Paul neighborhood, plus downtown St Paul is a lot more visible than it is here in this photo. In case you cannot quite read what it reads around the circle surrounding the eagles bust, it is today's title. 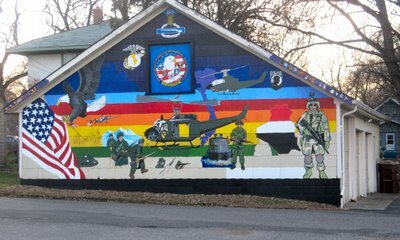 I found this mural in West St Paul, just off of Robert Street and Annapolis. It doesn't look quite complete at the moment as I see traces of things to be painted. What stuck me odd and I just had to turn around and get a photo of the mural was this is on the side of someone's garage. You can see their home beyond the garage. Quite a statement to have painted on your garage for all to see. 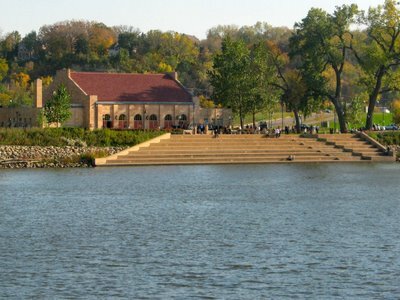 Just outside of downtown St Paul is Harriot Island. In the photo is the main building where some events take place. If you look close, there was a wedding going on during the time of my photo. I could hear some music and see the bride and groom walking around together, although I cannot locate them in this photo, but they are there. Trust me! 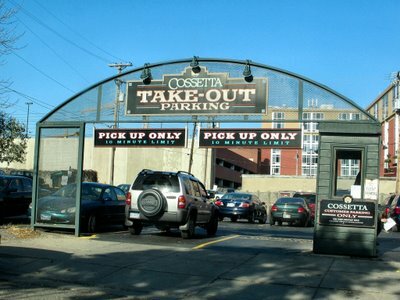 If you are ever in town, Cossetta's Pizza on 7th Street just outside of downtown is the place to visit. 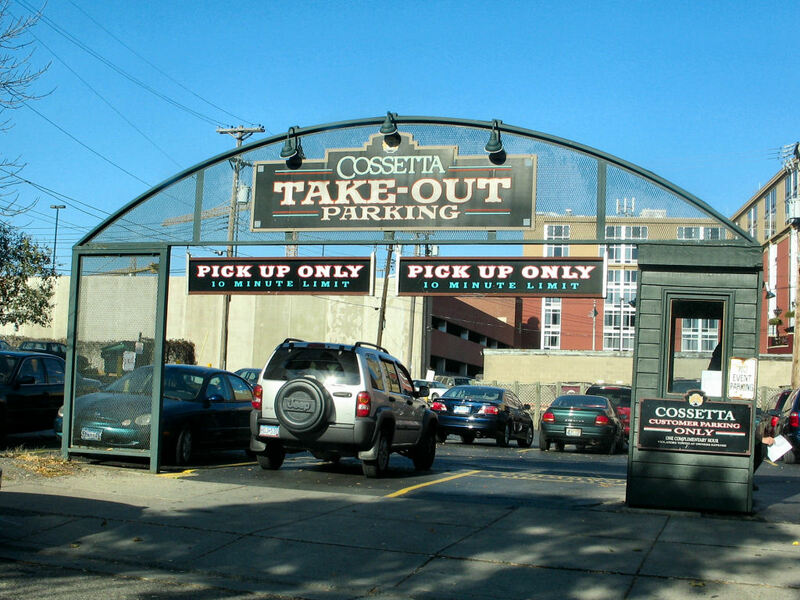 I've been getting pizza from Cossetta's for many years. They used to own a building about two blocks away, at the time, it had no indoor seating and they had three or four tables outside that were used only during the warmer months of the year. The place was very small, but the pizza was outstanding. When they moved to their new building, the pizza was the same, they added indoor seating, and life for them is good as can be. They are about a block from the Xcel Energy Center and get tons of business before any events. If you cannot make it in to eat, they recently added this two stall "to go" parking spaces so you will never have trouble finding a spot to pick up your pizza. A photo submitted from my dad from early fall. Not sure how many black birds are hidden from view due to the railing, but how many you can see in the photo was quite a large number. 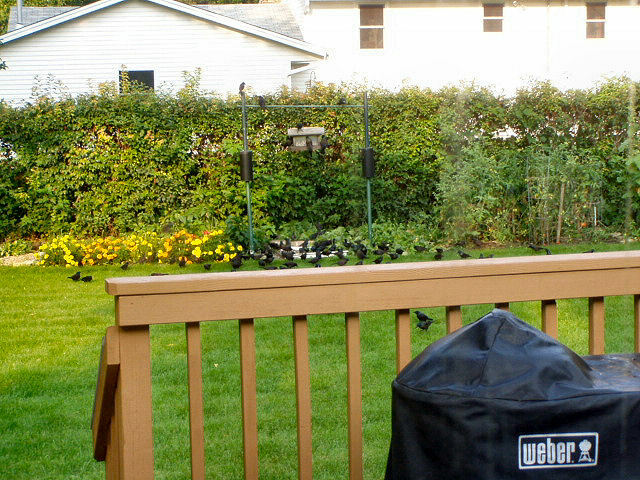 There is a bird feeder there in the middle of the garden, but what brought that large number of birds there at once? This shot was taken about a few weeks ago at the end of October. 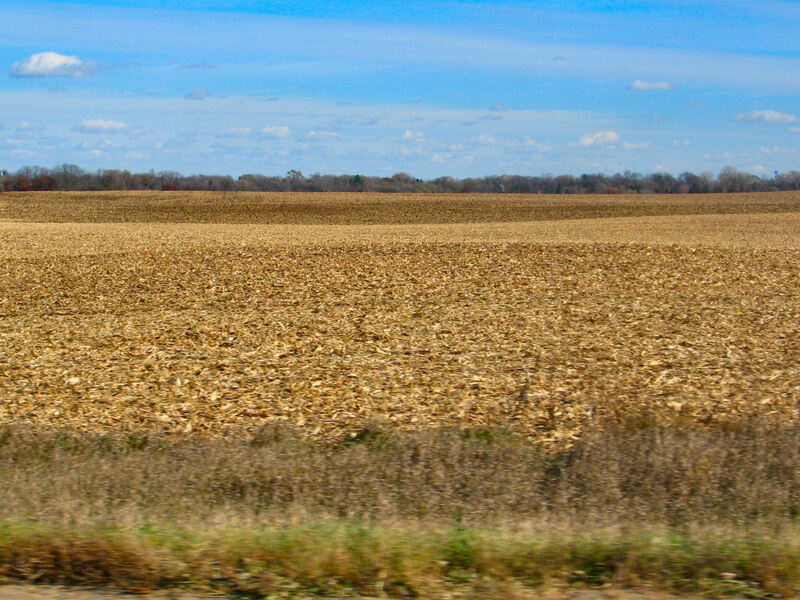 I was driving in Woodbury and saw this field looking the way it is. Now normally, this is covered in flowers, shrubs, plants and there is never any spacing like there is. I would guess this is how it's always looked during the fall, but I just never drove by it this time of the year. What caught my eye that day was the suns reflection on the dirt which is covered with water. It doesn't quite show up in the photo the way I saw it, but this should give you a better idea of the photo. If you are wondering, this place is one of several nurseries that belong to Buell's. They are a supplier of landscaping supplies. The building with the red roof was my intention for this photo. That building is the St Paul Public Library. 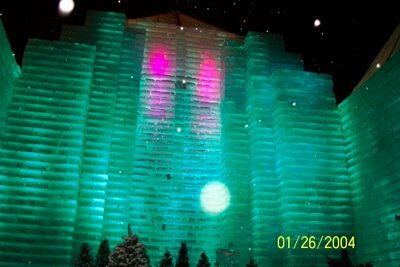 I have not been in there in quite some time now, I was a child last time and I went there with my mom several times. I recall all the stone walls and stairwells and the size of the library was amazing. I'll have to make a trip in there one of these years and bring my kids. Same location as from yesterday's daily photo, but just one boat, one very large boat. 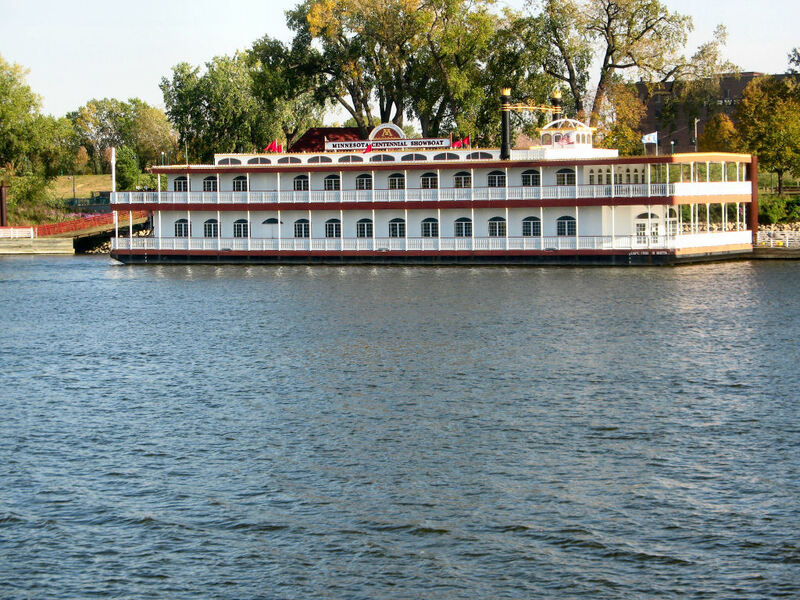 Although I'm not sure what the use of it is, but the "M" is the University Of Minnesota's trademark maroon and gold. I'm not sure what their hand is with the boat, but I really liked the looks of the boat. 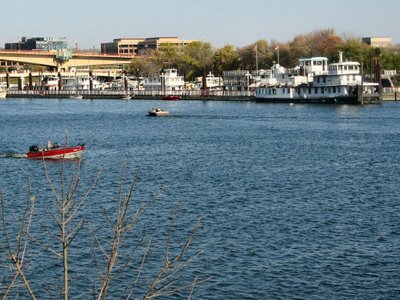 Have a couple more Mississippi River photos to post yet. This one has a lot of larger sized boats docked up across shore from where I am standing. To the back of me is downtown St Paul. 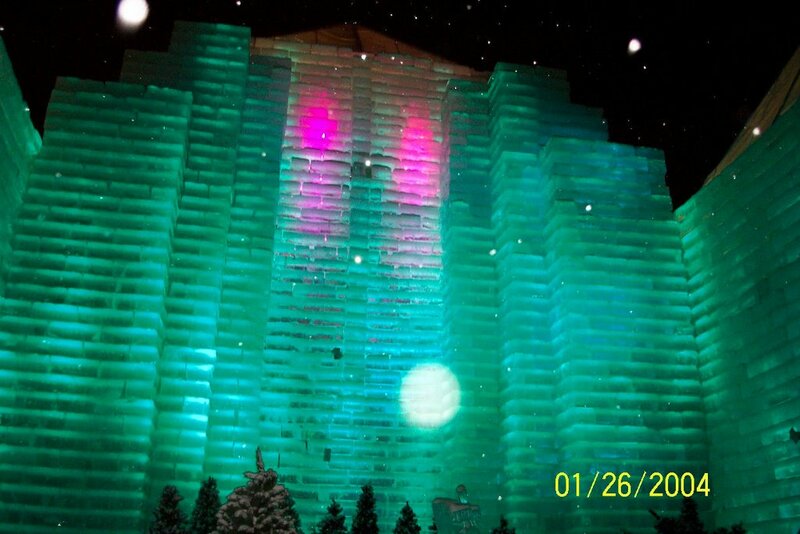 This is the main tower of the Ice Palace built in downtown St Paul during the 2004 Winter Carnival. If you wonder around the Mall Of America in Bloomington into the rides area. It was called Camp Snoopy when it first opened, but is now just called, the Park At The Mall Of America. I guess the contract with the Snoopy name was up and they couldn't agree on something, so the name was dropped to it's current generic name. 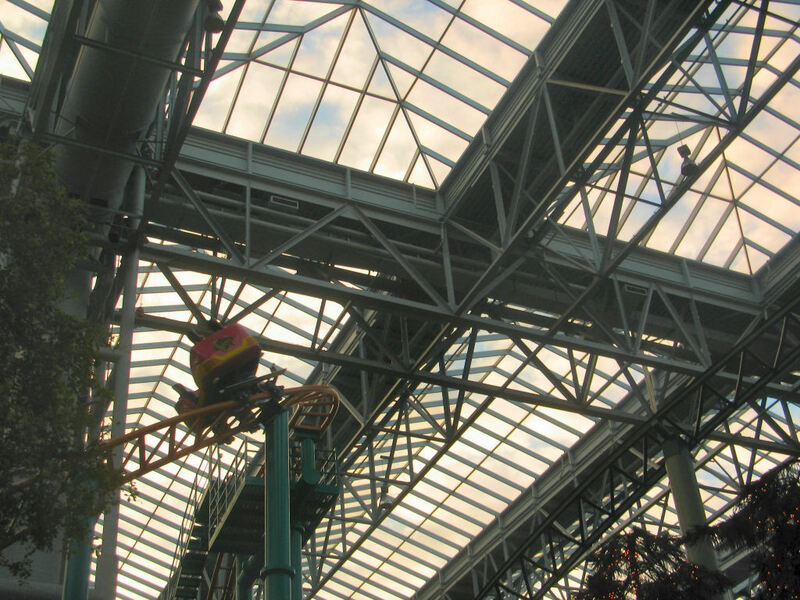 If you look up in the park area, you can always tell what the weather is like as the entire roof is made of what you see. Glass? Plexiglas? Something see-through? Plus you can look at the heating ducts and how well they are blended into the structure. I saw this from a distance from where I was standing and thought it would make a great photo. It's a Snoopy and Woodstock statue that is proudly displayed in the front entrance of a small, I believe it looked it a small apartment building. What a great and fun entrance to your home. 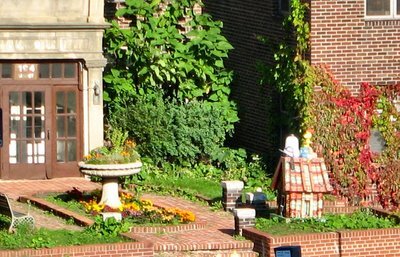 The Snoopy and Woodstock statue was from a few years ago when the city of St Paul for three years in a row had various panted statues of the Peanuts gang on display in various parts of the city. When the city was finished with having them on display, one could then purchase the statues for your personal enjoyment of display them at your business for your customers enjoyment. 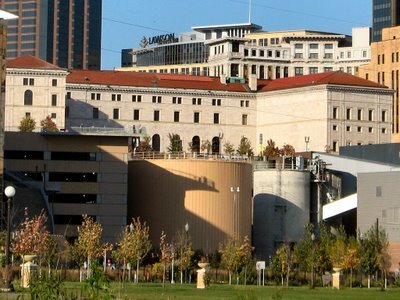 I am standing on the north side of the Mississippi River as it flows around downtown St Paul. 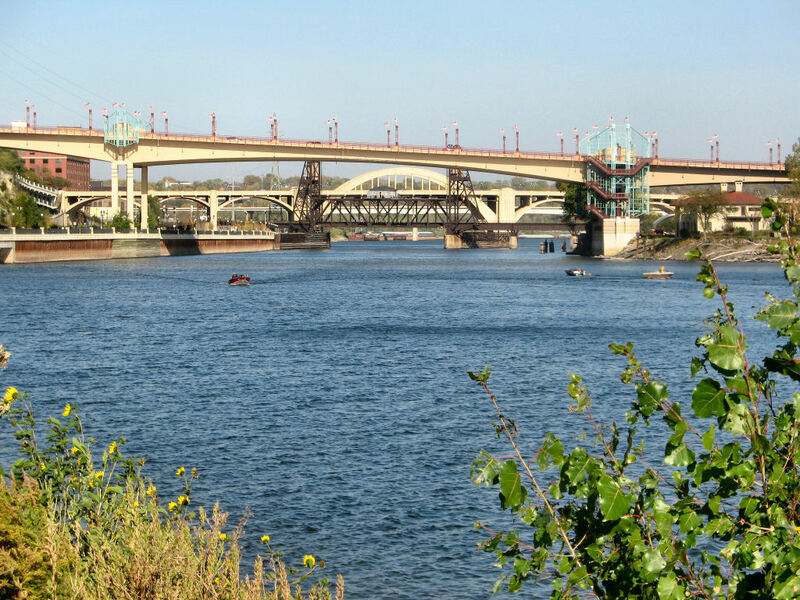 The first bridge is the Wabasha Street Bridge, also called the Freedom Bridge. 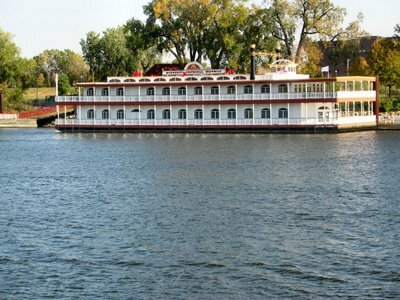 Then we have the train lift bridge that is still in use today. 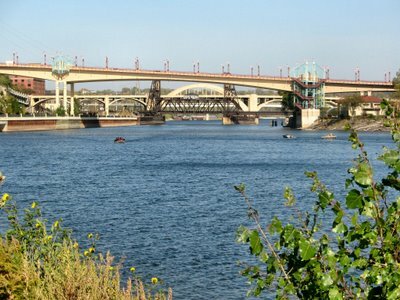 Next is the Robert Street Bridge. The last bridge which is barely noticeable is the Highway 52 bridge, it pretty much looks like a white line in the distance. Medic you ask? I did not notice it when I took the photo, but in the lower left corner of the photo is an Army medical vehicle of some kind. 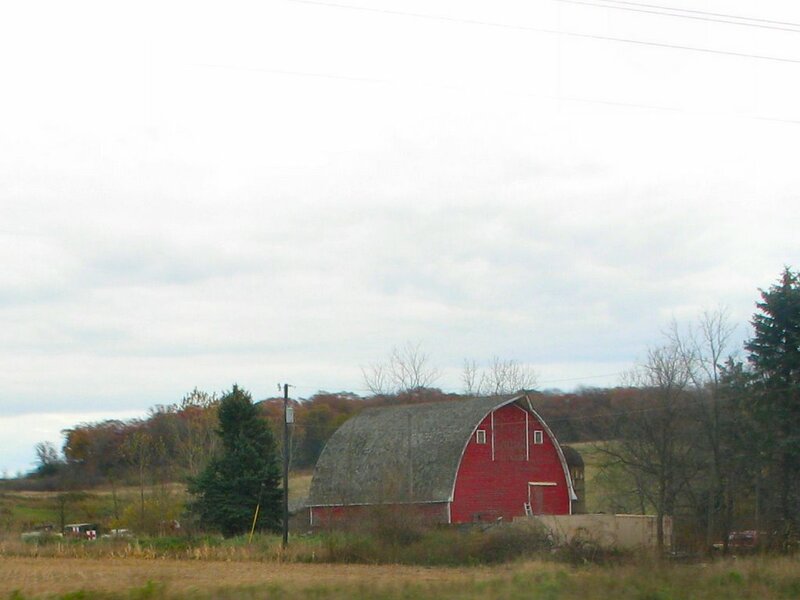 My intention was of the barn in the backyard of a home here in Cottage Grove. I believe this area was farm land at one time and perhaps the barn was part of the original farm. Today it is a barn in the back yard of a newer home, but they have a good plot of land to go along with it. Oddly enough, this photo was taken on Military Road, which is part of the "back roads" as we say here in Cottage Grove. Really the back roads are just a way to get from city to city without traveling on the highway. This is yet another farm out here in Cottage Grove. I believe this one is just a small hobby farm that is in much better shape than yesterday's photo. I really like the colors in this photo with the bare trees. 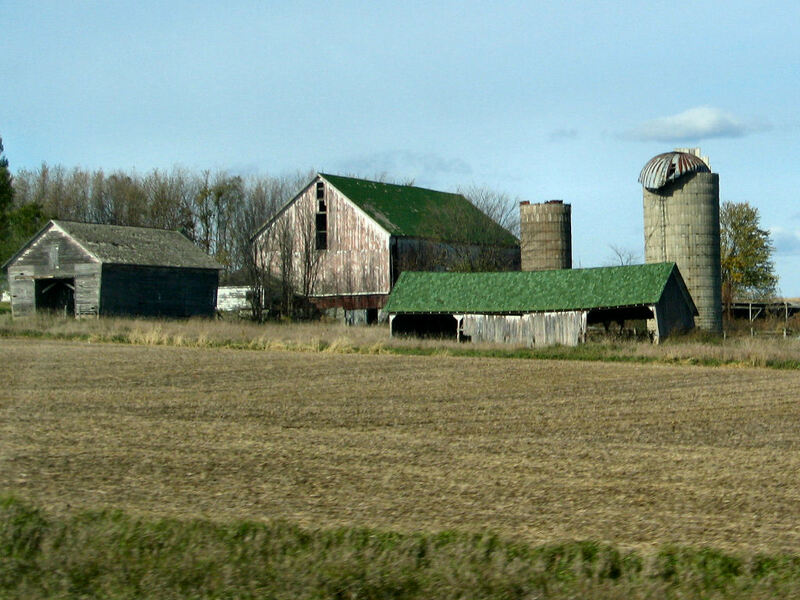 Here we have a farm out in Woodbury, which is just north of Cottage Grove. It's actually an active farm as you can tell the crops had been recently cut like yesterday's photo. 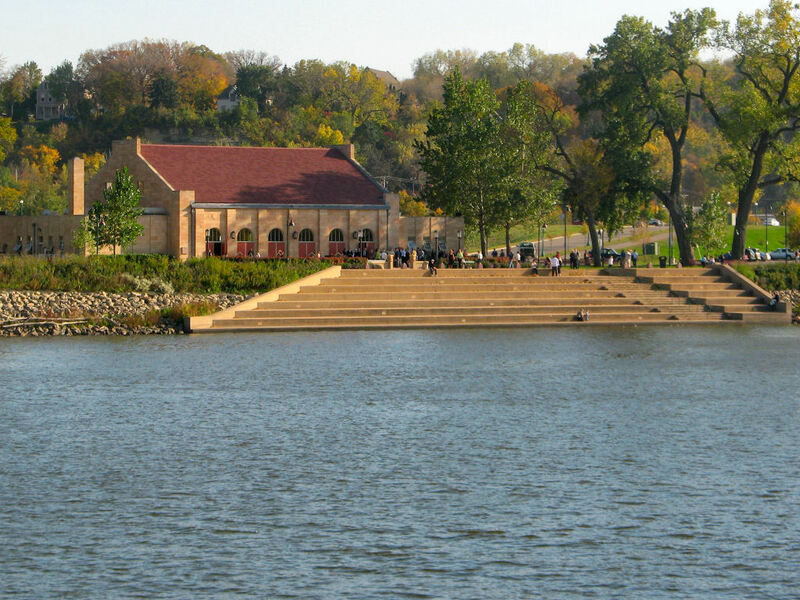 However, they need a major overhaul to get the place in top shape. I'm not sure if this part of the farm is in use, but there were other areas that were well kept. I just liked this shot for the character it has. There are still quite a few farmers here in Cottage Grove. 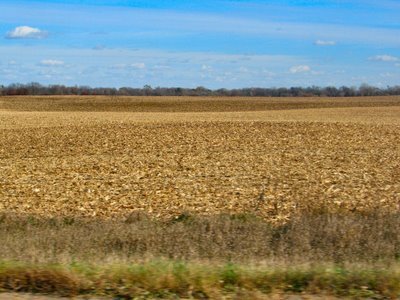 I've recently noticed that the majority of the crops have been cut out completely for the season. It's quite a quick change from seeing talk green corn stalks to this trimmed dried up remains in such a short amount of time. Yet it happens every year and is a sign that winter will soon be here. You see, I'm a bit troubled by the words Sheriff and Pott, not to mention Keep Pott on a political sign. 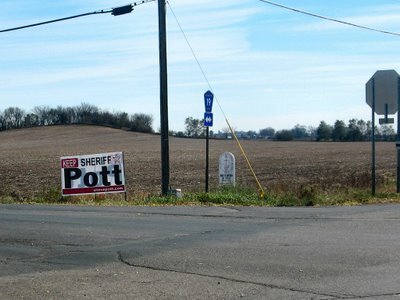 Sheriff Pott is up for re-election in my county and for some reason, I believe this guy will win based on his name. Maybe it's just me, but I laugh when I see these campaign signs in yards. I know nothing about Sheriff Pott and I don't know if I'll vote for him, but I will get out and vote on Tuesday, make sure you do too. Then finally, these horrid political commercials will end! This building in shambles is actually attached to the photo I posted back on October 14. It's the remains of the main building attached to several silos that used to be used for storage of whatever was carried in the Mississippi River barges. 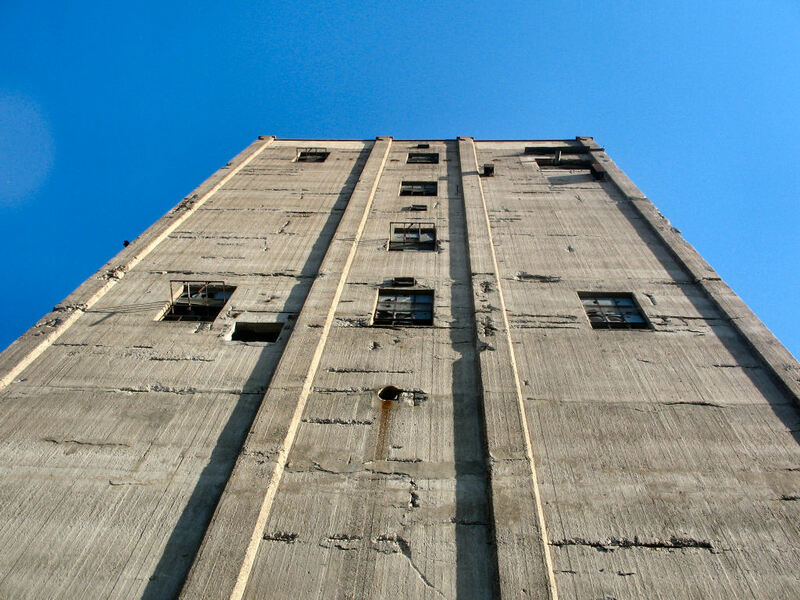 The silos are long gone, but the main building is still intact in it's worn out structure. As ugly as the building is, I hope they are able to keep it here as it is a part of St Paul's history that is long forgot. In my neighborhood in Cottage Grove, for the past 6 or 7 years, there is one house that goes way beyond the norm for Halloween celebrations. 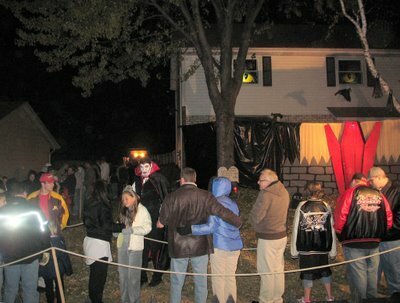 They put on a haunted house for the kids, mom and dad, anyone who wants to enter the haunted maze, they are welcome. Get this, the haunted house is free of all things. That my friends gets the top Halloween award. I believe the person in the photo dressed up as Dracula is the owner of the home that puts on this wonderful event. I know a lot of direct neighbors help out year after year. I drive by this home quite often, so I see a couple months before Halloween happens that there are items going up in the yard. Tombstones, bats hanging from trees, the gateway into the backyard where it all starts. So much work and effort goes into this and to top it off, the last couple years he has been asking for food donations so they can collect food for the food drives that happen around Thanksgiving time. It's a win, win situation for all. Hats off to who ever you are that does this for the kids and adults. My son has been through the haunted house now two years and he looks forward to so he can brag to his friends that he went to a haunted house. So we went through the line around 8:30 and there was about 150 people behind us when we went into the beginning of the adventure. I asked how many people had been through this year and their count went we entered was 713 people! 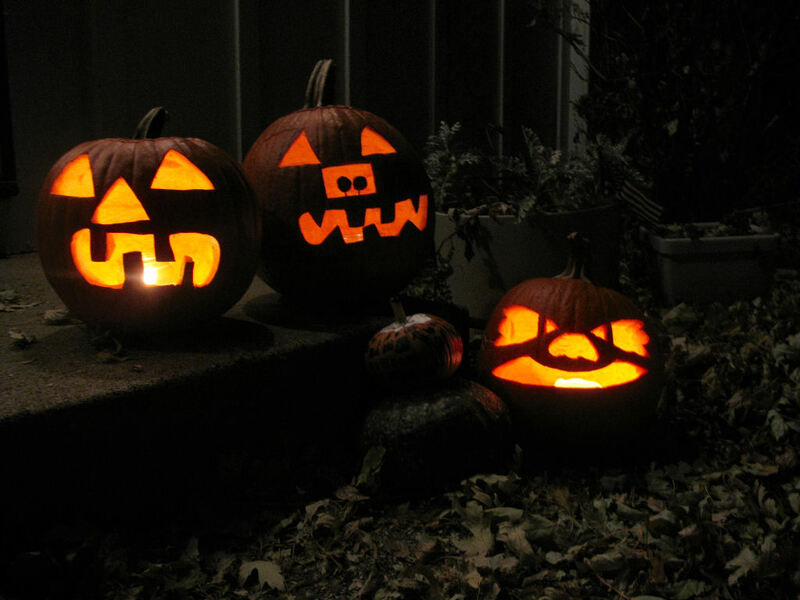 Halloween is all but over, the pumpkins featured in October 30's daily photo have been carved into Jack O'Lanterns. The pumpkin on the left is my daughters design, her very first pumpkin design. The middle one is my sons creation. He said it was a cross between a vampire [the fang teeth] and a pig [the nose] The last pumpkin on the right is my doings. I saw many great looking pumpkins on my walk around the neighborhood while my two children collected the goodies. Actually for my neighborhood, there appeared to be more kids out this evening than previous years. That was good to see and a bit surprising for the temperatures as cool as they were, about 27 degrees Fahrenheit. It's also amazing to see how many homes go way beyond the generic Halloween decorations and really create some wonderful, well thought out ideas. Makes it fun for the kids and us adults too as we walk around from home to home. 56 Daily Photo Bloggers around the world are posting a theme picture today of a something that is about to disappear; select a number to visit another: [Due to time zone differences and other factors, the theme photo may not be displayed until later if you are viewing early in the day] This was a tough one for me to decide. The warm weather is about to disappear. There is a bridge that I travel on that is being replaced by a new bridge. The leaves on the trees are soon to be gone. I decided to post something very local to my community. 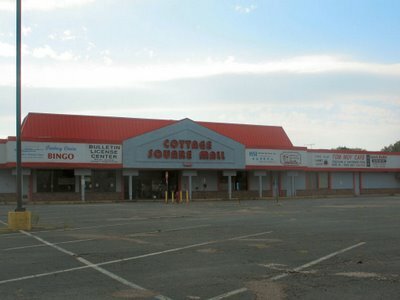 The Cottage Square Mall here in Cottage Grove will soon be torn down and replaced by a new senior living complex. It will be sad to see the building go, but the city has done a wonderful job of moving the stores that were occuping the building to new locations in the new shopping malls in various locations around town. It's a bummer to see it go, but there will be a lot of good out of this.